Hello Girls in summer dresses! Its that time of the year when weather transitions are happening for the worse. Heat and some more heat. But it doesn't deter our spirits. We have our favorite summer companions -shorts/minis/hats/umbrellas to make this time worthwhile! And now, I am sure you must have stocked on the Za true white two-way foundation as it contains SPF! Well, for those of you who haven't ,read my review here & buy it here. 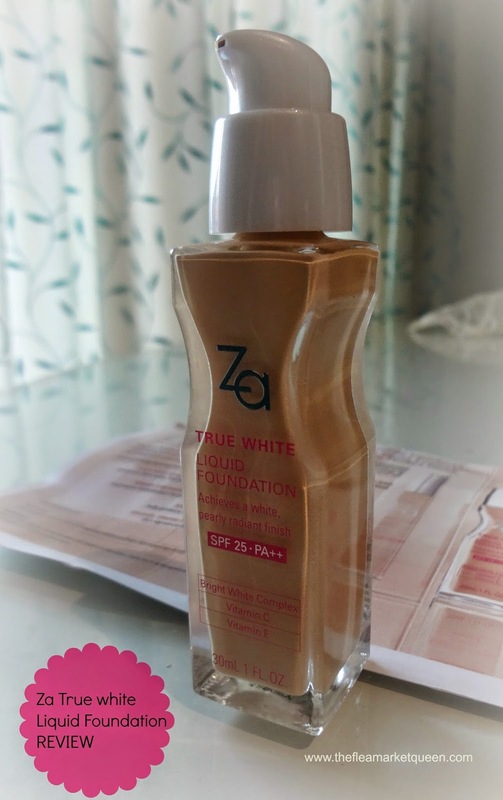 Let me now introduce you to another member of the family- The Za true white liquid foundation, again with an SPF . Lets see if this can be your new summer companion especially during the evenings! Well, evenings because this liquid foundation contains small gold specs to illuminate the skin and you would be surprised with the results as you read below. What the product says: Enriched with Vitamin C & E, Minerals & Hyaluronic acid, this Breakthrough Illuminating & Poreless Liquid Foundation creates Pearly Translucent & Radiant skin. SPF 25 • PA++ protects skin from UVA and UVB. Get Brilliant Luminosity and Perfect Finish Now get long lasting satin smooth & even-toned coverage. Shades: Comes in 6 shades . Refer the Za color chart to know more about what each shade implies. All shades have been created keeping in mind the asian skintones and I must say they have done a brilliant job at that! The OC30 shade was recommended to me by the Za skin expert and look how its blends into my complexion without looking like a foundation! Travel-friendly? It is travel friendly depending upon how you carry it. You cant just throw it into any bag as its a glass bottle. Wrap in a nice cotton bag when you need to carry it on a holiday. Fragrance: Like all Za products from the True-white line, this foundation also has a faint rhubarb/rose fragrance that fades away with application. However,the fragance is so natural & refreshing, it elevates the mood. Directions for use: Its important to prime the face before applying foundation. 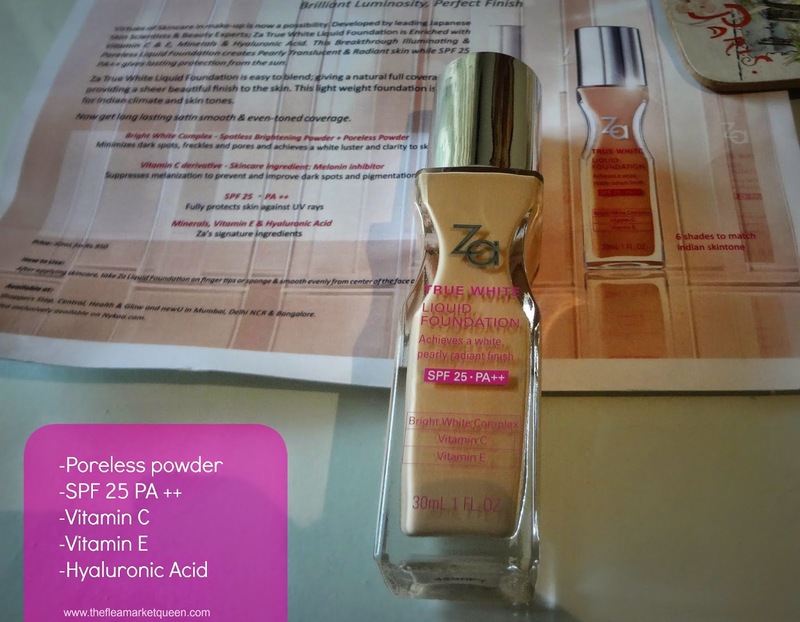 I prefer using Za perfect solution moisturiser on the face before applying the foundation. This moisturiser is perfect for Mumbai summers and lets my oily-combination skin breathe while giving it the perfect balance of moisture. After application of the moisturiser, I use the foundation . 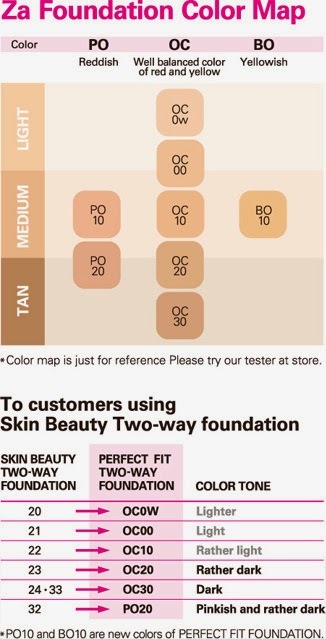 If you want to know how much of the foundation is required for the entire face, refer my swatch below. Yes,almost 1/4th of a pea-size amount! Dot your face with this amount and tap with fingers. The foundation absorbs beautifully. Coverage: The foundation is highly pigmented,which explains the tiny amount required to give coverage to the entire face. Because it has luminous gold particles,it illuminates the skin making you photo-ready and flawless! I didnt need a concealer inspite of acne blemishes! Final Verdict: Need I say more? The no-edit pictures below tell you how the Za true white liquid foundation is like fairy dust- your fairy godmother just waved her wand & blessed you with. The skin looks so luminous ,you need nothing else to layer! This is one power packed product which needs no accompaniments to make you look fresh & flawless as a dew-drop. Yet another oily-skin loving product from the stable of Za. Finally we can enjoy the virtues of skincare in makeup products. With the goodness of SPF, Melanin inhibitors & lot more, I cannot ask for more in a foundation! Thank you Za. I have more reasons to love my oily skin .